Glory for Ford Edge began back in 2007, when it made its debut as a midsize crossover SUV. 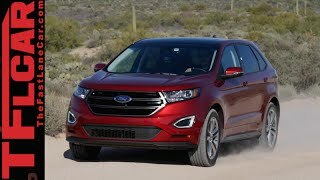 Since then Ford kept on introducing upgrades from time to time and moving over the boulevard we have Ford Edge 2015 offering its buyers, two new engine options hiding beneath its sharper exterior. 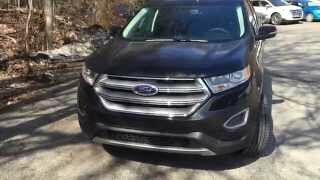 Let us have a look at the Ford Edge 2015 review. Interior of Ford Edge 2015 doesn’t bring to you much of changes with it. However the dashboard and center console has some visual changes that you’ll notice. The queue here begins with two vertical air vents located in middle and also the new center button array. Cabin is silent and looks clean with high-strength steel and sound lessening material covering the door panels from inside. There is an eight-inch touch screen display that allows you to control the sound system and customize your cabin with vocals you want to hear. Interior of Ford Edge 2015 has enough of space inside with rear passengers getting an extra 1.9 inch of legroom and 1.0 inch of headspace. 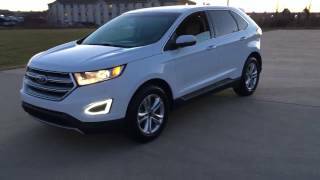 Exterior of Ford Edge 2015 elaborates a new beginning of an era with crisp lines dominating the exterior looks. The model gets a fresh face with large air vents getting joined with fake vents too, located close to tires. 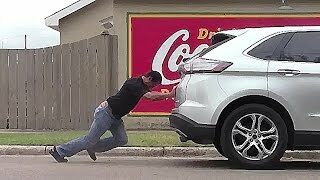 Lights get similarities matched with the Fusion recently released and being loyal we don’t find any harm in it, after all the good and decent is created to be carried. In all the exterior of Ford Edge 2015 is great with these and lower rear diffuser. 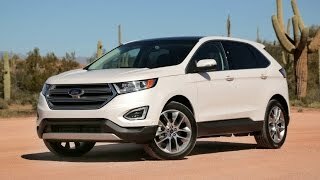 Ford Edge brings with it two new engines beneath the hood and thus buyers have an option to chose best out of three available powertrains. Most efficient in the list is a 2.0 Liter EcoBoost engine delivering total output of 245 hp and peak torque of 373 nm. Second comes a 2.7 Liter EcoBoost V6 engine delivering 315 hp and 475 nm torque while the last one is a 3.5 Liter Ti-VCT throbbing total output of 280 hp and peak torque of 339 nm torque. The estimated combined fuel efficiency rating for three is calculated at 23 mpg, 21 mpg and 21 mpg respectively. All three engine come paired to six-speed SelectShift automatic transmission.